This luxury Sanibel Harbour unit features outstanding Gulf and beach views from the 4th floor. Enjoy the sunset from the balcony’s high back, tilt-swivel, cushioned chairs or table that seats four. The unit was totally renovated and refurbished in 2016, giving it a completely fresh and bright feel. With two bedrooms, including one king, two twins, and a sleeper sofa, it sleeps six comfortably. The fun and bright ocean-themed décor and furniture just screams South Florida! It has a desk, Wi-Fi internet, an expandable dining table with seating for up to 8 people, and all new, gel-infused memory foam, Serta iComfort beds in both bedrooms, ensuring your nights are just as peaceful and relaxing as your days! 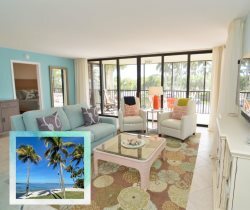 For a vacation experience you won't forget rent this unit or other great Sanibel Harbour rentals on the beach today. You may have found this rental on HomeAway #4363824 , VRBO #4363824ha or Vacation Rentals #4363824. We have been coming to this facility for over twenty years , visiting in October. This year we rented two apartments for our family including our 10 month old granddaughter. As always a terrific experience.Standards never drop.We plan to visit again, either in October 2018, or Spring 2019.